Do you have trouble reaching up high to reach your laundry supplies, like detergents, bleaches and fabric softeners? 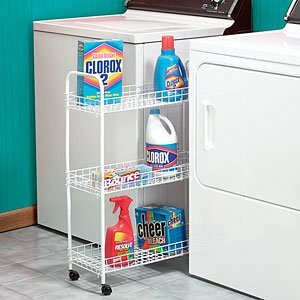 Do you need more room to keep all of your stain removal supplies handy, and within easy reach as you add clothing to the washer or dryer? If so this three shelf rolling caddy may work well for your needs. It is designed to fit between your washer and dryer, making use of this otherwise wasted space. To allow you to reach the items you place on the shelf it rolls out when you need to get to something, and then rolls back into place and out of the way after you've used the item you needed. 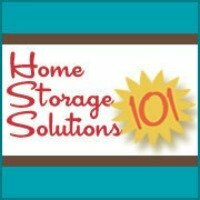 Besides using it in your laundry room, you could also use it in any other narrow spaces where you need to store things, including bathroom supplies or cleaning products, for example. Please note that because this item puts things in easy reach of small hands, like children, it should be used with caution in households with small children, if you keep any products on the shelves that you don't want kids getting into.